Things have gone well for Boun Lod since her last surgeries in March. The wounds on her face are healing up nicely. To reduce scarring, Boun Lod wears a hard plastic mask except when she’s eating. While the mask isn’t very comfortable, especially on hot days, she wears it without complaint. The Philadelphia Shriners Hospital has completed Boun Lod’s prosthetic arms, and she has been in to have them fitted and adjusted. Having lived her whole life without arms, and being able to do many things with her feet, Boun Lod is not really sure what to make of these new appendages. She says the prosthetics are heavy, but compared to no arms at all I guess that’s hardly surprising. Boun Lod with her arms and face mask. Once the graft donor sites on her back and the wounds from her latest surgery are healed up, she’ll really be ready to start learning to use her new arms. Up until she returned to Cincinnati for her latest surgery, a teacher associated with the Philadelphia school system visited Boun Lod every Monday for one-on-one sessions. Boun Lod was even more excited when she was able to attend regular classes with other children. In September, Boun Lod will start kindergarten in Philadelphia. On Friday, July 17, Boun Lod had additional surgery on her arms and sides. The surgery went well, and she was happily eating chicken nuggets for dinner that evening. Boun Lod was released from hospital the next day, and the family moved back to the Shriners Parent’s House. Everything was fine at Boun Lod’s check-up the following Friday, and the family returned to Philadelphia on July 25. Boun Lod’s next surgery is scheduled for early November. The surgery will be to make further repairs to her face and neck. With additional surgery scheduled for this fall, Boun Lod and her parents needed to extend their US visas. With help from the Cincinnati Shriners hospital we completed the paperwork, and six-month visa extensions (until April 2010) have been issued. We hope and expect that this will enough time to complete this round of treatment. Boun Lod and her parents have been away from home for close to a year now, and they’re anxious to get back to see family and friends, and to return to work. Air Canada, through its Kid’s Horizons programme, continues to be a great supporter of Boun Lod. By this spring, Boun Lod and her family had used all the travel miles that Kid’s Horizons had originally agreed to provide. We’re very pleased to report that the programme has agreed to provide the additional flights that Boun Lod and her parents will need to complete her treatment. Many thanks to the Kid’s Horizons programme! On that note, I’d like to encourage everyone with Aeroplan miles to consider making a donation to the Kid’s Horizons programme. 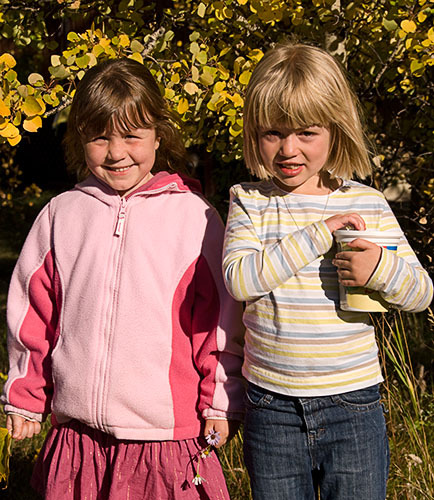 If you have extra miles, if your miles are about to expire, or even if you just want to support a great cause, please check out the Kid’s Horizons website: http://www.aircanada.com/en/about/community/kids/index.html. Boun Lod’s parents remain very pleased with, and grateful for, the excellent care Boun Lod has been getting in both Cincinnati and Philadelphia, and for all the help and support they have received. Boun Lod’s mother says it’s “a dream come true”. Thanks again everyone for helping to give Boun Lod a chance for a better life! Noi, Boun Lod, and Via at the Shriners Parent House after Boun Lod's surgery. On Saturday, March 28, I used some of my frequent flyer points to fly to Cincinnati. Boun Lod and her parents arrived the same day from Philadelphia. The time had come for Boun Lod’s second round of surgery. Boun Lod was admitted to the Shriners Hospital on Sunday, and had her first surgery early Monday morning. The surgeon released the skin on Boun Lod’s cheek and under her chin, and the results were immediately noticeable. Even with all the swelling and dressings, her mouth appeared “bigger” and “straighter”, she had definition in her lips, neck, and chin, and her left eye was less droopy. Her chin is small, but the doctor thinks it should grow now that it’s not restricted. 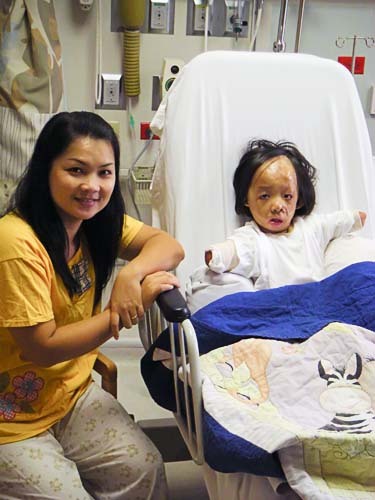 On Tuesday, Boun Lod went back to the operating room to have skin grafted from her back and onto her face. A sort of plastic dressing that was held in place by metal staples replaced Monday’s bandages. Boun Lod with her mother after her second surgery. Boun Lod was a little sick after Monday’s operation, but felt better after Tuesday’s surgery, and was eating quite a bit by Wednesday. On Wednesday morning, we wheeled her down to the playroom and she played video games, manipulating the controller with her feet. Via and Noi are doing well, although they were pretty tired after a couple of nights of getting woken up every hour or two as the nurses came in to check on Boun Lod. Boun Lod, feeling better, with her mom and dad. The surgical staples were removed on the Sunday following her surgery, and Boun Lod was discharged on Monday. The family moved back to the Shriners “Parent’s House” in Cincinnati where they’ll stay for the next several weeks while Boun Lod heals. For many months, Boun Lod will have to wear a plastic “goalies mask” to put pressure on her skin to keep thick scar tissue from forming. She’ll also have to continue wearing her other pressure garments for some time. The doctors thinks she might need one more operation on her mouth and eye in three or four month’s time, and before she goes home, but we won’t know for sure until she heals up from this round of surgery. In case Boun Lod and her parents have to stay a while beyond their one-year visas, we’re starting the process of applying to extend them. Boun Lod will also need additional surgeries when she’s about 8, 12, and 19 years old. When Boun Lod has recovered enough to travel, the family will fly back to Philadelphia to stay with relatives. The Shriners Hospital in Philadelphia is making prosthetic arms for Boun Lod, and they should be ready when she gets back. Once final adjustments have been made to the arms, Boun Lod will start learning how to use them. For several weeks prior to returning to Cincinnati for this round of surgery, an occupational therapist from the Philadelphia school board visited Boun Lod every Monday to work with her. We’re now in the process of getting Boun Lod registered to start kindergarten in September. People continue to be very generous in their support of Boun Lod, and donations and other forms of support continue to arrive. Boun Lod was very pleased with a “Christmas Box” that came all the way from Pincher Creek. In March, the Women In Fellowship Unit of the Trinity United Church Women in Fort Macleod held a silent auction in conjunction with the church’s annual Roast Beef Supper and made a very generous donation to the Boun Lod fund. In another display of kindness and generosity, a group of ladies (Brenda, Dorothy, Janet, Karma, Linde, Marilyn, Wallace) got together and made a “Boun Lod” rag doll complete with an extensive collection of clothing. The really special thing about the doll is that, like Boun Lod, its arms end at the elbows, but it has “prosthetics” that can be attached to the stumps. I delivered the doll (complete with its “Dora the Explorer” travelling case) to Boun Lod. She and her mother were really taken with it. When I explained that “a group of mothers” got together to make the doll for her child, Noi got a little misty eyed. The last thing she said as I left the hospital to return home was to “please thank everyone again”, and “please thank all the mothers”. Boun Lod’s first two surgeries in November were to improve her mobility by releasing skin under her arms. Since she’s gotten out of her splints, she’s been showing everyone how high she can lift her arms. Looks like the operations were successful! Boun Lod and her parents flew to Philadelphia in early December to stay with family there while Boun Lod continues her recovery. All of her wounds have healed, but her parents still do twice-a-day therapy with her to reduce the amount of hypertrophic scar tissue that forms. She must be growing at a great rate, as the burn pressure garment she’s been wearing since she left Cincinnati is already getting too small. Christmas was an exciting time for Boun Lod. She was thrilled to see the “real” Santa, as opposed to the “stand-in” that comes to Lao. Having said that, she looks a little more wary than excited in her Christmas photo. Apparently she was able to tell Santa what she wanted, as something arrived for her on Christmas Eve. As mentioned before, Boun Lod has also been accepted as a patient at the Shriners Hospital for Children in Philadelphia. The hospital’s specialty is orthopaedics, and Boun Lod has had her first clinic visit, starting the process of getting her prosthetic arms designed and built. Once the prostheses are ready, the therapists will work with her and teach her how to use her new arms. Several weeks ago, an assessment team from a social services agency that works with the Philadelphia school system visited Boun Lod to determine how best to help her integrate into the school system. We understand that the report is ready, and we’re just waiting to see what the team recommends. We expect Boun Lod to start school very shortly. We had expected Boun Lod’s next surgeries to be in mid February, but the dates have now been set for the end of March. 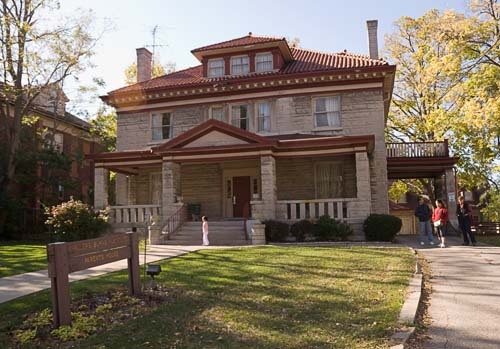 The family will return to Cincinnati shortly before Boun Lod’s late-March admission date. We don’t know exactly what the surgeons have in mind for this round, but we expect them to begin cosmetic surgery on Boun Lod’s face and neck. Boun Lod and her family will put the next few weeks until her March surgeries to good use by continuing her therapy, by getting her prosthetics organized, and by getting her off to school to make some new friends and to improve her English. I used some of my frequent flyer points to fly back to Cincinnati for Boun Lod’s first two surgeries, and for the first few days of her recovery. Boun Lod’s first surgery was on Monday, November the 10th. The operation released the skin under each arm. On Tuesday, the surgeons grafted skin from her back onto the newly–released areas. Boun Lod did very well. She was very brave, and gave a “thumbs up” with her big toe as they wheeled her through the operating room doors. She was also remarkably good-natured after returning from the recovery room. Boun Lod had some pain, and nausea and vomiting after her first operation, but the medical team found a more optimal combination of medications for her second surgery. After her second operation, the only thing she complained about was being hungry, and having an itch on her nose that she couldn’t scratch. She was even able to smile and laugh a bit, which was pretty remarkable given what she’d been through, and given the fact that her arms were splinted out at a 90° angle to her body and tightly wrapped in elastic bandages. Via and Noy are also doing well. It’s tough for anyone to see a child in pain, but it’s got to be so much harder for the parents. Even though a few tears were shed, Via and Noy are coping admirably. The Shriners hospital is great, and the staff is wonderful. Everyone has been very kind, concerned, and helpful, and the medical care seems to be of the highest standard. Everyone from the nurses to the orderlies to the cleaners do their best to make the atmosphere as friendly and pleasant as possible. Boun Lod will likely be in hospital until sometime during the week of November 24, when the family will move back to the Parent’s House for a couple of weeks. If everything goes according to plan, they’ll travel to Philadelphia on December 6 for a couple of months of recovery before the next round of surgery. There is a Shriners Hospital in Philadelphia as well, and its specialty is orthopaedics. We’re hopeful that Boun Lod will be able to get her prosthetic arms designed, made, and fitted there while she recovers from her surgery. Boun Lod is also most anxious to start school, and we’re trying to get her into kindergarten or some other type of school program in Philadelphia. Boun Lod is picking up English quite quickly. She likes to watch the children’s shows on TV, especially the ones that teach the alphabet and numbers. She happily follows along with programs, learning as she goes. Via and Noy are also doing their best to improve their English. They constantly refer to their Lao–English dictionary, and we had numerous discussions, complete with plenty of arm waving and hand gestures, to explore the meanings of different words and expressions. I’m pleased to say that I even improved my (very limited) Lao. Via and Noy said to say hello to everyone, and to thank everyone again for all their concern, help, and kindness. Boun Lod had her first surgery yesterday (November 10), and her second today. Yesterday’s surgery was to release skin under each arm, while today’s surgery was to graft skin from her back onto the newly-released areas. All things considered, Boun Lod has done very well. She didn’t cry or make a fuss going to the operating room either day, and she has been remarkably good-natured after returning from surgery. Tomorrow the therapist is planning to get Boun Lod onto some type of wheeled stretcher so she can take her to the playroom to have some fun. Via and Noy are also doing well. It’s tough for any of us to see a child in pain, but it’s got to be so much harder for the parents. Even though there have been a few tears shed, Via and Noy have been coping admirably. The Shriners hospital is great, and the staff is wonderful. Everyone has been very kind, concerned, and helpful, and the medical care seems to be of the highest standard. Thanks Shriners! Cathy and I were delighted to see Boun Lod and her parents walk through the gate at the Cincinnati airport about mid-afternoon on Tuesday the 28th of October. At that point, they’d been travelling for almost three days. Via and Noy were tired, but Boun Lod was bright as a bee. Via’s brother Pat, and Pat’s niece Cindy were also on hand to great them when they arrived. We were immediately struck by how much Boun Lod had grown since we last saw her in July 2007. 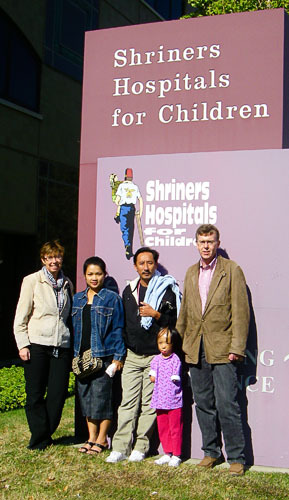 From the airport, we took Boun Lod and her parents to a hotel near the Shriners Hospital. After a quick bite, they crashed in their room looking forward to twelve hours of sleep. Or at least that was the plan. Perhaps predictably, Boun Lod was excited and not terribly tired, and kept her parents up for a good part of the night. The next day we all went to the hospital for a tour, and then went over to the Parent’s House and started to get them settled in. Over the next several days, we got to know the family even better than before. Boun Lod is a terrifically happy kid, and was excited with everything she saw. She liked elevators and escalators and WALK signs and kiddie slides and doors that open with the push of a “handicapped” button and, well, everything… When we took her to the hospital she was interested to see that there were other burned kids. She jumped right in, as kids do, and started playing with them. And she was particularly interested in the hospital school. She wanted to get in there and start reading the books, and colouring, and using the computers. Boun Lod even liked going to the grocery store and to Target. She laughed and giggled as we wheeled her around the store at high speed. She was amazed with all the books and toys, and wanted to turn every electronic toy ON by pushing the buttons with her stumps. And she couldn’t get enough of the snow globes. She impressed the staff at Circuit City by how quickly she learned to play the display video games using just her stumps—”Hmm, that’s pretty cool”, as the young store clerk said. Noy and Via are happy to be in Cincinnati but, understandably, they’re worried about what’s to come. They’re also a little overwhelmed by everything. They have to deal not only with the surgery and therapy, but also with a totally different culture where they don’t speak the language. Even things we take for granted like using an electric stove or an automatic washing machine are new to them. Still, they’re taking things in stride, and are doing their best to “go with the flow”. Boun Lod had her first visit with the surgeon, anaesthetist, and medical team on the Friday. The medical team already had a plan worked out, and the examination confirmed that the plan is appropriate. They’ll start by releasing the skin webbing under her arms and then, in subsequent surgeries, work on her face, neck, and scalp. 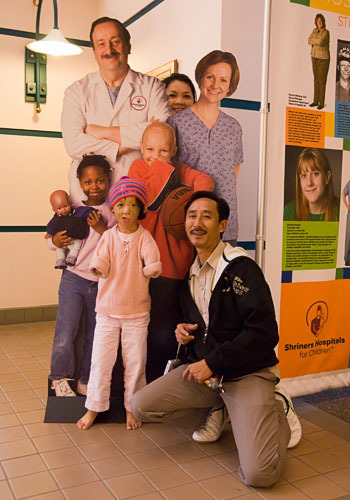 Boun Lod, Noy, and Via mugging with a cutout at the Shriners Hospital. Via and Noy are happy, pleased, and grateful for all the assistance they’ve received. To everyone who’s made a donation, organized a fundraising event, sent things, or otherwise helped with the effort to send Boun Lod to Cincinnati they say, “Kop chai du”, or “Thank you very, very much”. They also wanted to let everyone know that they’re respectful of all the help, and that they’ll do their best to make the most of this opportunity. Boun Lod’s first surgery is scheduled for Nov 10. I’ll take some of my frequent flyer points and fly back to Cincinnati to be there for the surgery, and for her first few days of recovery. Thought it was about time to do an update on some of the recent fundraisers. Lao "Walkathoners" Andy, Greg, Shannon, Ben, and David. John joined the walk for the last couple of days. The walk was relatively uneventful. We had a support team who carried our stuff and picked us up in the evening and took us back to our guesthouse. Everyone enjoyed it and remained in good spirits the whole time despite blisters and sore limbs. Every morning we set off at 5:30 and walked until about 11:00. After lunch we rested/collapsed into bed for a few hours. Beginning again at about 4:00, we walked for a few more hours until it was time for some good food and a few of the Lao brewery’s finest before hitting the sack. On day 5 we stumbled into Vientiane looking bedraggled and rather pathetic, but still victorious. A massive Thank You! to Anna and Chan who formed our support team and saved us from dragging along heavy backpacks. Good work team! Walking for five minutes in the Lao heat and humidity is enough to drench my shirt. I can only imagine what walking for 5 days and 156 km would be like. You guys really earned your Beer Lao’s! Friends of Boun Lod from the Pincher Creek Rotary Club. At their Thursday, Oct 16 luncheon meeting, the Pincher Creek Rotary Club presented the Boun Lod Fund with a cheque for the proceeds from their Oktoberfest. The $2550 cheque is most welcome and much appreciated. Thanks again Rotary Club for your help and support! A lot has happened in the three weeks since we last updated this blog. To begin with, Boun Lod and her parents have received their US visas. Yea! We’ve also booked their air tickets, and they will leave Vientiane on October 26, and arrive in Cincinnati on October 27. Boun Lod’s first medical appointment is scheduled for October 31, and her first surgery is scheduled for November 10. Cathy and I are planning to drive to Cincinnati, and we’ll meet Boun Lod, Via, and Noy when they arrive. With the family’s permission, Cathy will attend the initial medical evaluation so she’ll be in a better position to explain the surgery and treatment plan. The fundraising has been going tremendously well. People have been very interested in Boun Lod and her story, and the outpouring of compassion has been heartwarming. Individuals, families, groups, and companies have made very generous contributions to the Boun Lod fund. Thanks to you all! I hate to single out any specific contributions, because they’ve all been wonderful and much appreciated, but here are some examples of the sort of assistance the Boun Lod fund has received. The students at the school at the Pincher Creek Colony sent a lovely donation with a note that said, ” [We] Would like to donate this year’s Christmas monies to your cause.” Thanks students! Your donation is a big help. 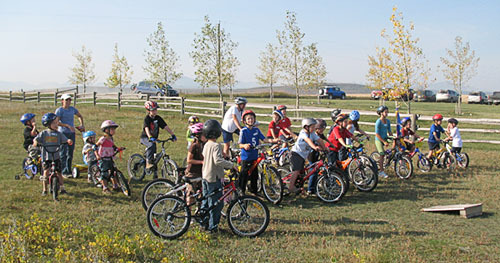 On September 20, the Bosch family sponsored a bike rally to raise funds. The riders paid an entry fee, and got sponsorship for their rides. McClelland Meats, Sobey’s, and the Co-op donated food. Some 57 riders “rode for Boun Lod”, and over 100 people attended the event. In the end, over $6000 was raised. Good work Marla, Jeff, and family, and many thanks! On the same day as the bike rally, but on the other side of the world, an evening fundraiser was taking place in Lao. There was food, a quiz, and other activities, and about $1000 was raised. Not long after the evening fundraiser, a group of teachers from Vientiane College lead by Andy, David, and Ben set out to walk the 156 km from Vang Vieng to Vientiane to raise money for Boun Lod. 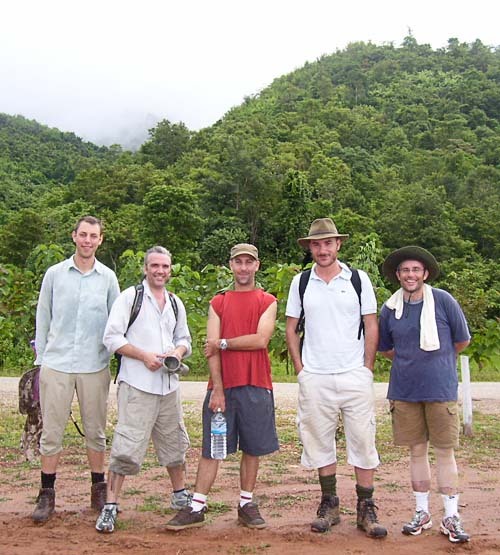 While we’re still waiting for details and photos, we’re pleased to report that after some five days of walking the group arrived, “relatively unharmed”, in Vientiane. The walkers are still soaking their feet, and counting the pledges, but they think they have raised almost $5000. We really have to commend our friends in Lao for raising some $6000. This is a great deal of money anywhere, but an amazing amount for a poor country like Lao. Thanks folks, this is an awesome achievement! On September 27, Neige had a party to celebrate her fifth birthday. Instead of bringing presents for her, Neige asked her friends to make a donation to the Boun Lod fund. Thank you Neige. It was very sweet and kind of you to think about another little five-year-old girl from the other side of the world. This past Friday night saw us eating sausages and sauerkraut, and drinking beer, while dancing to polkas, waltzes, and the chicken dance. It was the Pincher Creek Rotary Club’s annual Oktoberfest celebration, and all the proceeds of the event will be donated to the Boun Lod fund. We’re not sure what the final tally will be, but there was a good turnout, lots of beer was consumed, and the items in the silent auction were well bid on. A sincere thanks to Ingrid, Karin, and all the members of the PC Rotary Club. Not only did Val and Jim make a very generous donation, but Val also made a lovely “cuddle quilt” for Boun Lod. Thanks for your thoughtfulness Val. Hopefully the quilt will give Boun Lod some comfort during the difficult and painful days that are to come. Last Friday I went to Canyon School and spoke to the students about Boun Lod. The students have started raising money for the Boun Lod fund, and Canyon and Matthew Halton schools are having a competition to see which school can raise the most money. Thanks and good luck! Happy Thanksgiving everyone. Cathy and I will be thinking of all of you who have been so kind and generous in your support for Boun Lod. Raise a toast to yourselves. You deserve it! We’re also working on other fundraising ideas and initiatives, and we’ll let you know more about them as they develop. In the meantime, thanks to everyone who has helped so far, and thanks to all those who are working on upcoming fundraising events. Together, we’ll make it possible for Boun Lod to get the treatment she needs. It’s been several weeks since our last update, but things have been moving along well, and we’ve made some real progress. One of the most exciting developments is that Air Canada has donated enough frequent-flyer points for Boun Lod and her parents to fly from Vientiane to Cincinnati return, and to make three round-trip flights from Cincinnati to Philadelphia. (Boun Lod, Via, and Noy will stay with relatives in Philadelphia between surgeries.) This is a tremendous help, and we’re grateful for Air Canada’s very generous assistance. We’re also continuing to receive many generous donations and pledges, including an extraordinary pledge of $10,000 from an individual who prefers to remain anonymous. The total of all the cash pledges and donations we’ve received to date is around $15,000, putting us about halfway to our goal. On August 21, Cathy, Nin, and I spoke about Lao and Boun Lod at the Pincher Creek Rotary Club’s luncheon meeting. Individuals at the meeting donated several hundred dollars on the spot, and the club has agreed to donate the proceeds of its Oktoberfest celebration to the Boun Lod fund. Let us know if you’d like tickets for the October 3 dinner and dance. We also understand that the Lao fundraising events, including a walkathon and a raffle, are getting underway. This leaves us with a couple of lovely donated raffle prizes, but no way to raffle them off. We’re putting on our collective thinking caps to try and come up with a legal way to make use of these generously donated prizes. On the medical side, Boun Lod’s first scheduled appointment in Cincinnati is on October 31. She should be admitted on November 9, with her first surgery the next day. We’ll book the flights to Cincinnati in the next day or two, and plan to have them arrive sometime between the 27th and the 29th of October. Last week, Via and Noy had their visa interview with the US Embassy in Vientiane. The Embassy requested more financial information, which we’ve provided, and we’re hopeful the visas will be issued shortly. Thanks to all of you that have already made donations, or have assisted in other ways. And for those of you who haven’t helped out yet, it’s certainly not too late! We still have another $15,000 to go.